This paper is published in the History of Anthropology Newsletter, 35: 1 July 2008. My thanks to the editor, Henrika Kuklick for agreeing that it also be published via the project website. Please note that it is possible that this version varies very minutely from the HAN version. This paper concerns Beatrice Blackwood's work before she joined the Pitt Rivers Museum when she worked next door in the Oxford University Museum of Natural History, the Department of Comparative Anatomy, and her interest was mainly in cranial studies. However, it must have influenced her later work on British ethnography. Alison Petch, Pitt Rivers Museum, University of Oxford. I have been engaged for some years on research projects examining the history of the Pitt Rivers Museum (PRM) at the University of Oxford and its collections. Recently, I have been examining the English collections held at this ethnographic museum in close detail, as part of the UK Economic and Social Research Council-funded project, “The Other Within.”  Although the findings reported in this paper have turned out to be only tangentially related to my main research subject, they provide insight into one form of anthropological fieldwork at the University of Oxford in the UK in the 1920s and 1930s. This work was related to philosophical and scientific debates widespread at that time, not only in academia but also in politics: all over Europe, scholars, politicians and members of the general public were increasingly interested in nationalism, defining “native populations” and historical antecedents. The first hero of our tale is Beatrice Mary Blackwood (1889-1975). She was an undergraduate at Somerville College, Oxford between 1908 and 1912, before Oxford conferred degrees on women, studying English Literature and Language. She returned to Oxford in 1916 to study for the Diploma in Anthropology at the PRM, which she earned with distinction in 1918. In her coursework, she had studied a diverse range of anthropological subjects,  but she must have been most interested in physical anthropology, choosing to undertake further study with Arthur Thomson (1858-1935), the Dr Lee's Professor of Human Anatomy. He worked in the Oxford University Museum (of Natural History) adjacent to the PRM. Buxton fulfilled a wide variety of roles for the University in addition to his teaching, being at different times Senior Proctor, Curator of the University Parks and of the Schools and Bursar, Dean and Tutor at Exeter College. He served as a city councillor and was also on the Council of the Royal Anthropological Institute (RAI). (Blackwood 1939: 204) Although Buxton was largely a physical anthropologist, he was interested in wider anthropological matters, ethnography and folklore studies. (Blackwood 1939: 204) He also wrote a guide to the Pitt Rivers Museum in Farnham (founded by Augustus Henry Lane Fox Pitt Rivers, the founder of the museum in Oxford). A letter in the PRM manuscript collections reports that Arthur Thomson had believed “that his young team of Buxton, Miss Blackwood and Penniman  were going to make revolutionary discoveries in evolutionary history.” (Blackwood papers, Box General Correspondence M-S, Letter from J.M. Edmonds of the Oxford University Museum to K.P. Oakley at the British Museum 25 September 1967) This promise was not fulfilled, since Buxton died prematurely and Blackwood's interests changed. Blackwood had certainly begun her anthropometric work on women in Oxfordshire villages by 1922-3. (Oxford University Gazette 13 June 1923, p.668) At some point between 1920 and 1939, Blackwood undertook an anthropometric study of female students at Oxford. 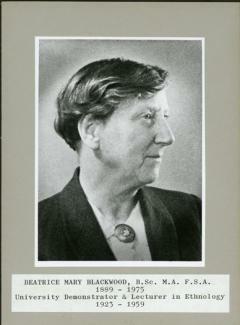 Her data were not published and were apparently lost, but they were referred to in a 1939 article, which described the survey participants as “a stringently selected population” and stated that “[m]ost of the female Villagers and all of the University women were measured by a single observer [Blackwood] and within two years of each other.” (Buxton et al 1939:7) She must have carried out this work at some point between 1920 and 1925. The work in Malta and Gozo concentrated on skeletal material from four different sources and different time periods, as well as measurement of the living. As regards the latter data, Buxton commented that, “as far as possible . . . typical Maltese were taken.” The researchers sampled schoolchildren, and males and females from both Malta and Gozo and both rural and urban populations. They obviously went to some lengths to try and get a representative sample, reporting, “The individuals measured include among the men representatives of all social classes; among the women the lower social grades are chiefly represented.” Some efforts were made to exclude people with foreign heritage: “all those who were either born of Maltese parents abroad, or although born in Malta are not of pure Maltese parentage, have been rejected.” (Buxton 1922: 174-5) The same methodology was followed when sampling from populations closer to home, in Oxfordshire. The 1932-3 Annual Report for the Oxford University Museum reported that Buxton carried out a study of the prehistoric peoples of the Oxford district in that year. (Oxford University Gazette, 8 December 1933 p. 206) On 16 February 1933, Dudley Buxton gave a lecture to the OUAS on “Oxfordshire folk,” “illustrated with lantern slides and exhibits of crania.” (PRM manuscript collections, OUAS meeting book I) The lecture was quite popular; 45 members attended. In 1934, Buxton and Blackwood published an article in Folklore that described their work in Oxfordshire. There is no record of why they decided to publish some eleven years after the majority of their fieldwork had been completed. Their choice of journal influenced their article’s content; rather unsuccessfully, they attempted to link folklore, anthropometric measurement and speculation about racial origins. Their decision to publish in Folklore may have been made because of the considerable interest in folklore in Oxford at this time. It has already been reported that Buxton had given a lecture titled “Oxfordshire Folk” to the OUAS on 16 February 1933. At the next meeting (9 November 1933), there was another talk of local relevance; Elsie Corbett presented “Folklife Survivals in an Oxfordshire village” to an audience of 50 members, “including members of the affiliated Oxford Folk Lore Society.” Henry Balfour  also spoke to the society on 26 April 1934 on “Notes on some British folklore material in the Pitt Rivers Museum,” and a Miss Violet Mason talked about “Oxfordshire folklore.” On 20 February 1936, F.G. Parsons described 'The Chiltern Crosses.” On 2 November 1939, Ellen Ettlinger delivered “Documents of British superstition in Oxford.” Folklore was obviously in vogue among anthropologists in Oxford during the 1930s. (PRM manuscript collections, OUAS Meeting book I) Both Blackwood and Buxton were members of the Folk-lore Society. The final outcome of the research was an article published in the Journal of the Royal Anthropological Institute in 1939, “Measurement of Oxfordshire villagers.” Pages 4-8 of the article give detailed findings. To twenty-first century eyes, some of the conclusions seem quaintly of their period. Plotting the home villages of the participants, the researchers found, unsurprisingly, that they were dealing with “an essentially South Midland rural population,” and their sample represented “the ordinary peasant folk of the region.” Most people's “family homes” were originally either in Wiltshire, Berkshire or Buckinghamshire (all neighbouring English counties) or in Oxfordshire itself. (Buxton et al 1939:2) They concluded, “[T]he Villagers are closer to the medieval people in head length and to the Saxons and Romano-Britons in head breadth.” (Buxton et al 1939:6) They did not discuss the significance of this finding. Blackwood had now lost two of her long-term mentors in the space of a few weeks, only a year after her return to Oxford from her final period of prolonged fieldwork and four years after the death of her closest counsellor, Arthur Thomson. The city must have seemed a very different place to her after 1939. In the short term, her mentors’ deaths dramatically altered and increased her daily workload, as she struggled to cover both Balfour and Buxton's teaching and museum commitments. Blackwood's interest in English ethnography and archaeology continued after Buxton's death. She joined the Oxfordshire and District Folklore Society, established in 1948 to “collect, record and study the folklore of Oxfordshire, and the neighbouring counties, and to further the study of the international folklore of these districts.” (PRM Blackwood manuscript collections, uncatalogued box, Folder “The Folklore Society 1948-9”) However, her commitment to the group only lasted until the following year, when she resigned because of other obligations. She was also a member of the RAI's 'British Ethnography Committee', contributing to the discussion about setting up a Museum of English Life and Traditions (which never eventuated). She continued to take an interest in local archaeology until her death in 1975. Between 1920 and 1939, Blackwood and Buxton tried to link folklore, local history studies and anthropometric research into a seamless whole, which would illuminate the local Oxfordshire population past and present. The links they perceived between local ethnography and physical anthropology were in part affected by the academic arrangements in Oxford and the historic way in which anthropology in Oxford had developed. Physical form was not an important feature of the Pitt Rivers Museum's displays. In the original exhibit of his collection at Bethnal Green Museum in London, Pitt Rivers had allowed only limited space for a very small number of skulls; he wrote that these were “examples of the typical skulls of some of the principal race.” [sic] (Lane Fox, 1874:1) However, he acknowledged the importance of studying and teaching physical anthropology. (Bodleian Library, Acland papers, Pitt Rivers to Henry Acland, 10 May 1882, MS Acland d. 92, fols. 79-90) In Oxford, material culture and ethnographic and archaeological artefacts dominated the displays, though some human remains (such as shrunken heads, and trophy heads) have always been shown (and been very popular with visitors). Blackwood and Buxton's work was not the last investigation of local villagers by Oxford physical anthropologists, however. From 1965, members of the Department of Biological Anthropology (as it was then called) undertook to research the total human biology of a group of villages in the Otmoor area. This site was chosen because of the excellence of local church records from the sixteenth century on, allowing the historical demography of the region and changing environmental and social conditions to be factored into the analysis. Researchers took blood samples and tested for “various genetic polymorphisms”; stature, bodyweight, IQ and personality traits were also measured. (Harrison 2007:128-130) They did not draw on Buxton and Blackwood’s studies. This would have been difficult, since Buxton and Blackwood did not publish the names of the villages in which they worked, though they evidently did in Stonesfield, Otmoor and Wychwood. Today, Buxton is a forgotten figure in general anthropological circles and Blackwood is best remembered for her pioneering work on cataloguing ethnographic museum collections and for her fieldwork and collections from the Pacific. However, in a letter to an Elsie Corbett of Spelsbury near Charlbury, Oxfordshire on 16 February 1931, Blackwood described her anthropometric research as her “immortal work.” (PRM manuscript collections, Blackwood papers, uncatalogued) Evidently, she was committed to human anatomy and physical anthropology during the 1920s and 1930s, though her attention turned towards museum ethnography and material culture as time went on. Indeed, it is clear that even after she moved to the Pitt Rivers Museum in the mid-1930s, she still felt that her craniological research was important. This paper sheds light on this obscure part of her career, and an almost forgotten collaborative partnership. The fieldwork Blackwood and Buxton undertook in Oxfordshire (and at the University itself) did not lead to any major discoveries, but it did show an early inclination to study “the other within,” from which the current research project to which I am connected can be said to descend. Our project does not study crania, but examines other physical evidence, the manuscripts and publications written about the collections by museum staff and researchers, as well as artefacts themselves as the raw data by which to measure the natives. The Pitt Rivers Museum is part of the University of Oxford and holds a large collection of ethnographic and world archaeological artifacts. It was founded in 1884 when a collection was donated to the University by Augustus Henry Lane Fox Pitt Rivers (1829-1900). The museum has been described as one of the great ethnographic collections in the world (Gosden and Larson 2007:xvii). For further information about this research project see http://www.prm.ox.ac.uk/englishness.html. For more information about the findings of the project see . It follows an early project, funded from the same source, called the 'Relational Museum' project with Professor Chris Gosden and Frances Larson. For further information about this project's findings see http://history.prm.ox.ac.uk/. She studied under Henry Balfour, Arthur Thomson, Dudley Buxton and Robert Ranulph Marett. The subjects included Balfour's series on aesthetic arts, industrial arts and prehistory; Marett’s seminars on social origins, world-wide ethnology and prehistoric Europe; Thomson’s lessons on human anatomy; and Dudley-Buxton’s lectures on geographic conditions and racial types. Some of her lecture notes survive (PRM manuscript collections, Blackwood papers, box 1 and box 1A), Further information about the diploma in anthropology course and its teachers in Rivière, 2007, passim. I am extremely grateful to Geoffrey Harrison, Fran Larson, Chantal Knowles and Peter Rivière for providing information about Blackwood and Buxton's careers. Thomas Kenneth Penniman (1895-1977), was born in the United States and moved to Oxford after the First World War. He studied for the Diploma in Anthropology, and later worked at the Department of Human Anatomy and the Institute of Social Anthropology before being appointed the Curator of the Pitt Rivers Museum in 1939, succeeding Henry Balfour. He was another very close lifelong friend and colleague of Beatrice Blackwood. Henry Balfour (1863-1939), the first Curator (Director) of the Museum. University of Oxford Archives, file FA/9/2/90. Pitt Rivers Museum manuscript collections, Blackwood papers, Box General Correspondence, Box 1 and 1a, Box 4, Box 21, General Correspondence M-S, uncatalogued papers. Pitt Rivers Museum manuscript collections, Oxford University Anthropology Society meeting book I.
Buxton, L.H. Dudley and Beatrice Blackwood. 1934. “An introduction to Oxfordshire Folklore.” Folklore, 45: 29-46. Gosden, Chris and Chantal Knowles. 2001. Collecting Colonialism: Material culture and colonial change. Oxford/New York: Berg. Harrison, Geoffrey. 2007. “Oxford and Biological Anthropology.” Pp. 119-136 in Peter Riviére, op. cit. Knowles, Chantal. 2001. “Reverse Trajectories: Beatrice Blackwood as Collector and Anthropologist.” Pp.251-272 in Michael O'Hanlon and Robert Louis Welsh, eds., Hunting the Gatherers. Oxford/New York: Berghan. Lane Fox, A. 1874. Catalogue of the Anthropological Collection lent by Colonel Lane Fox for exhibition ... London: George W. Eyre and William Spottiswoode. Oxford University Museum (of Natural History). Annual Report 1920. Parkin, David. 2007. “Oxford anthropology as an extra-curricular activity: OUAS and JASO.” Pp. 137-154 in Riviére, op. cit. Percival, A.C. 1976. “Obituary: Miss B.M. Blackwood.” Folklore 87: 113-4. Rivière, Peter, ed. 2007. ed., A History of Oxford Anthropology. Oxford/New York: Berghan. Jones, S. 1994. “Beatrice Blackwood remembered,” Pp. 4-6 in The Friends of the PRM 10th anniversary newsletter . Penniman, T.K. 1976a. “Obituary: Beatrice Mary Blackwood.” Oceania 46: 234-7. Penniman, T.K. 1976b. “Beatrice Mary Blackwood 1889-1975.” American Anthropologist 78: 321-2.